I have a new post up at my Writers At Play group blog about the new Star Trek movie. It includes a great quote from Lou Anders, Editorial Director of Pyr, on how this new accessible Trek can influence Science Fiction in general. As a fan of all things Science Fiction, I hope the new Star Trek movie not only introduces the genre â€” both in TV/movie and book formats â€” to a new audience, but I also hope the new audience realizes that Science Fiction is as much about the characters as it is about science. This, to me, tears down the stereotype that â€œSF is geeky, niche, and â€˜for losersâ€™â€ â€” and certainly not only for teenage boys. At the core of Star Trek are the relationships of its characters, of the various friendships that have sustained Kirk, Spock, and the entire crew through many challenges. 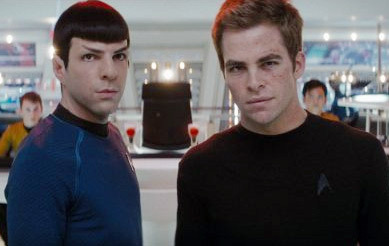 Spock notes this in the new movie when he meets the young Kirk and tells him: â€œI have been and always shall be your friend.â€ This kind of character-driven engine of the story should strike a cord with Romance readers since a defining feature of Romance is that relationships influence character.